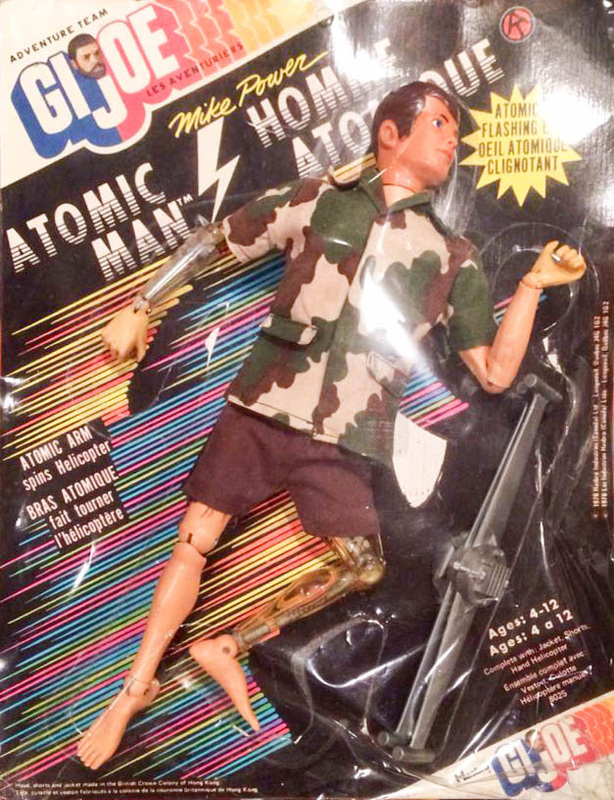 The flashing Atomic eye and clear mechanical limbs tell you that you are holding Mike Power, Atomic Man (8025). Mike Power was the first painted hair figure since flocking was introduced, but would not be the last when you consider Bulletman, the Intruders, and the low-end blow molded Defenders figure. Mike Power came with brown shorts and a camouflage shirt that used the same pattern first introduced with the AT Jungle Survival set. He also included a hand-held helicopter blade he could twirl to fly off to adventure. This was necessary because if he tried to run with just one Atomic leg he would end up going in circles. Later issue Atomic man figures have been called "Malibu Mikes" by toy maven John T. Marshall because their hands and limbs are molded in a more tan colored plastic. The one shown at the very bottom of this page is an example of that variation. Below right, the rare Sears coffin box version of Mike Power's packaging. To the left, the rare Bionic version of the tag that can can sometimes be found on early versions on the figure. Most tags read "Atomic Man." Lower left, Canadian bilingual packaging for the Atomic Man. Tag image courtesy of collector Dan McDonald, Canadian package courtesy of John Ramirez. 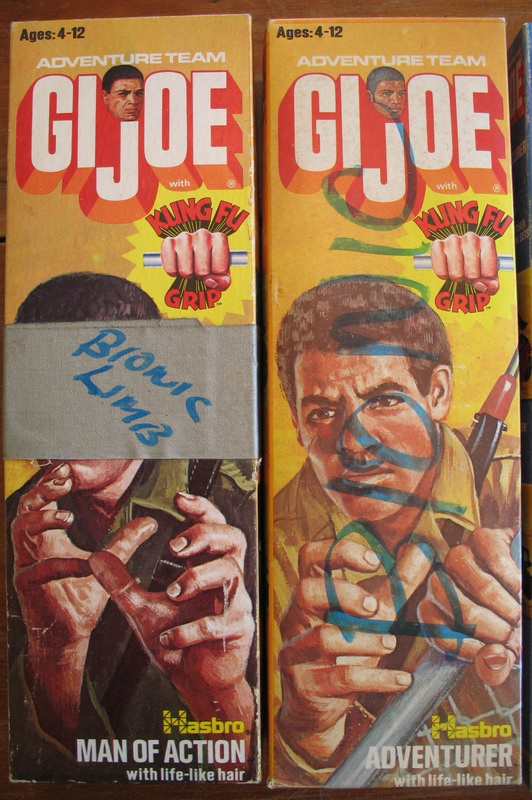 These two 1974 Kung Fu Grip figure boxes came in a lot directly from the family of a man who worked at Hasbro's Central Falls molding plant from 1969-1994. 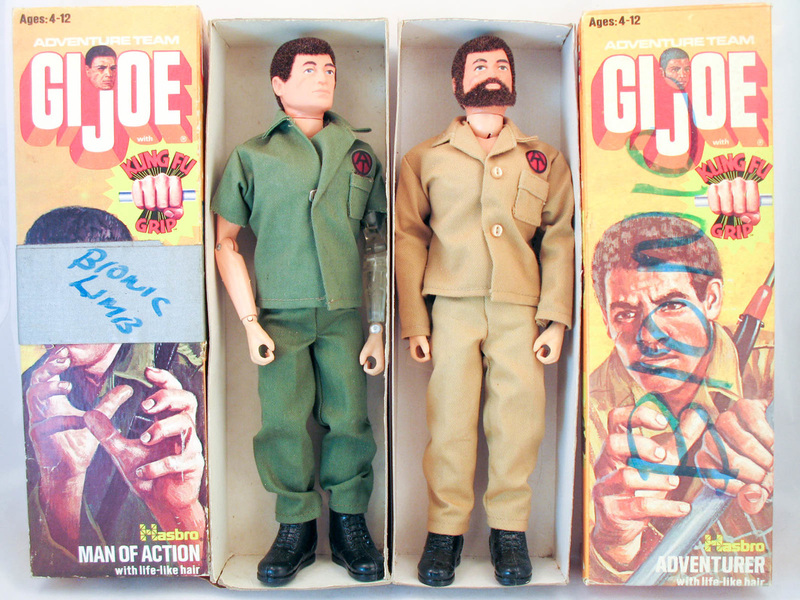 They are standard issue boxes, with "Bionic" written on the face and both ends of the Adventurer and "Bionic Limb" and just "Limb" on the Man of Action box. The Adventurer box contains the wrong figure (a Land Adventurer) dressed in the Adventurer's uniform, with only one minor change- the figures lips have been painted an odd orangey-pink. The collar of the shirt is sewn shut on the figure just above the top button. Apparently someone wanted the shirt to stay in place. This was sometimes done when photographing figures. The other box, however, contains what is apparently a prototype of Mike Power's "Bionic" (later "Atomic") arm. This interesting find shows the genesis of the Atomic Man. It also makes one wonder, did Hasbro produce a prototype of a black bionic figure, and, if so, where is it today? 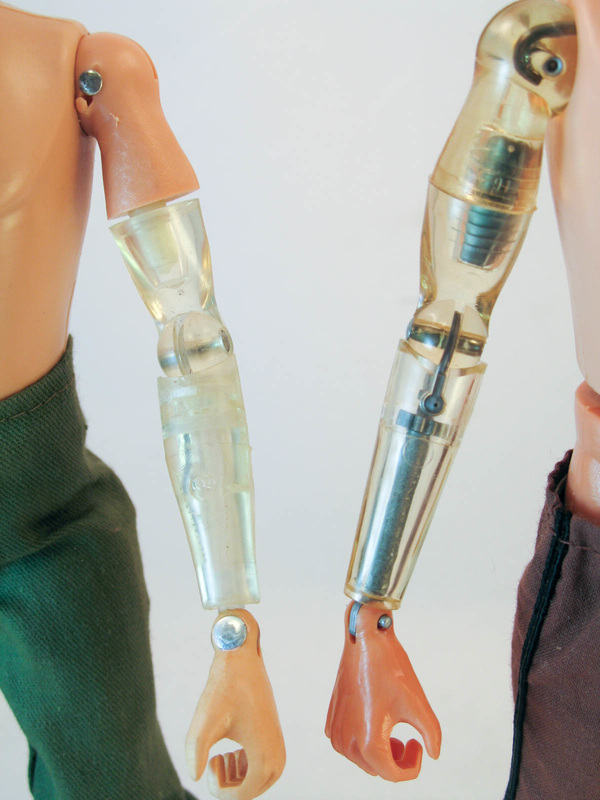 Left, the Man of Action displaying the prototype bionic limb. His uniform has had the sleeves cut off to display the arm. 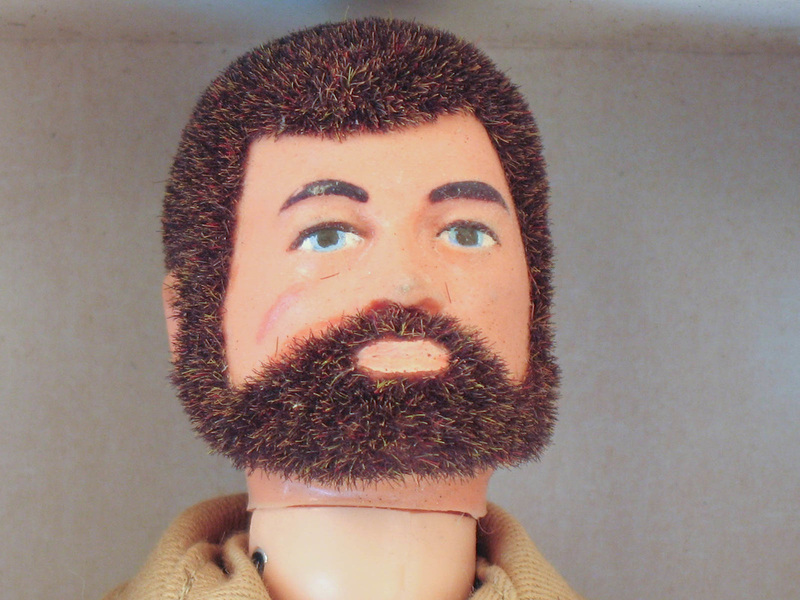 Below, the Land Adventurer head with repainted lips. Note the difference between the color of the figure's scar and mouth. Beneath that, the stitch holding the shirt shut. Right, The prototype arm compared to the production model. Note the placement on the figure's left as opposed to right. The bicep portion is marked only with a number '2' on the back, and the rivet is slightly recessed as opposed to flush on the later Atomic Man. Friend of the site Dr. Quest pointed out that this may be from a Henshin Cyborg figure from Japan. The forearm has a more natural looking taper that the straight version of the standard release, and is made in two parts that have been carefully drilled to be joined with pins, though the piece is apparently held together with a piece of clear tape. It is marked with a backwards '3' mold mark. The internal mechanism is molded in clear plastic (as opposed to silver), and the hand attached with an oversized rivet that was painted flesh color on the back. 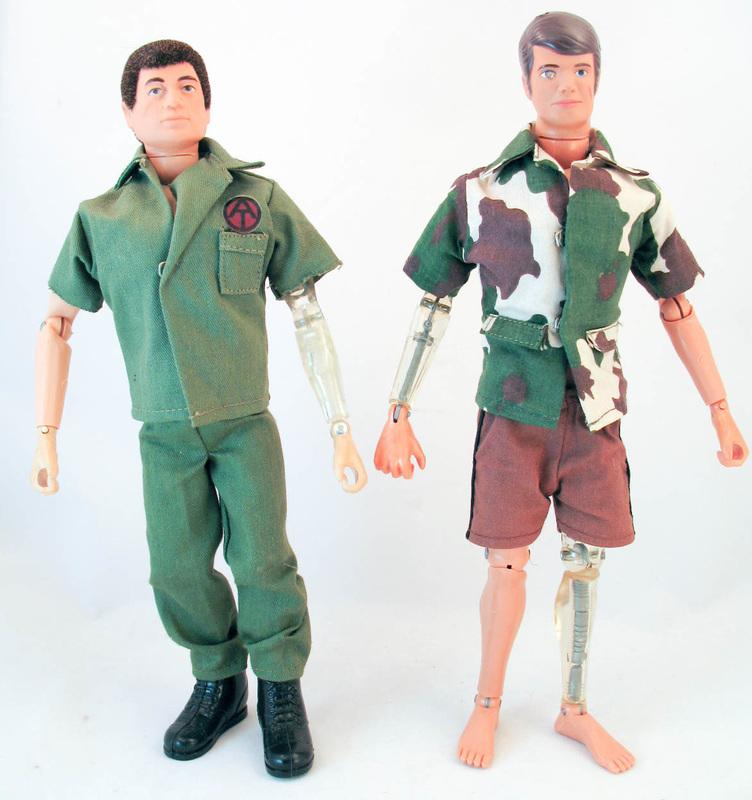 Mike Power stands with his uncle: GI Joe's first Bionic Man of Action!